For all its workmanlike strengths, they’re not words you would have ever associated with the Vectra. They are words, however, that Vauxhall and Opel executives would like you to associate with the Insignia, a car that they also rather spuriously claim ‘is not a Vectra replacement’. While obviously it does replace the Vectra, the Insignia comes at it from a completely different mindset. The Vectra was constructed from data and research, much of it gleaned from fleets, which Vauxhall interpreted as cold, dispassionate logic. As a result, it misjudged the product for a market where user-choosers increasingly ruled. The Insignia has been created with that kind of emotional, irrational user-chooser in mind. The exterior is an attractive concert of organic swoops and clever detailing, while the cabin is more inviting. It feels like no other Vauxhall product. Some might think that this new touchy-feely attitude is not the ideal starting point in a sector that is struggling, shrinking and resolutely conformist but Vauxhall sees gold in them there upper-medium hills. To attract lost customers back to the sector, while keeping the faithful contented, the Insignia offers more space, lots of trick technology and a range of five Euro 5 emissions-compliant engines – two diesel and three petrol – from launch. On the petrol front, there are three engines, a 140bhp 1.6, 220bhp 2.0 Turbo and 260bhp 2.8 V6 Turbo, while there are two new 2.0-litre turbo-diesels with either 130 or 160bhp outputs. In Europe, there’s also a 110bhp diesel but there’s little evidence of demand for it in the UK. The 2.0-litre diesels will account for three-quarters of the 30,000 sales annually, and possibly higher still in the fleet market because the petrol engines are tuned to be performance, rather than economy, orientated. In spring 2009, a 180PS 1.6-litre turbocharged petrol and a BiTurbo version of the 2.0 CDTi with 190PS will also go on sale, while later that year an ecoFLEX version of the 160bhp engine will be available. Keeping the high level of power while getting the CO2 figure under 140g/km is the target, and it can’t come soon enough if that really proves to be the case, because the standard range of engines are nothing more than OK in terms of emissions. A figure of 154g/km for both the 130 and 160 diesels just about keeps the Insignia in the hunt, but doesn’t offer any significant incentive in a market now dominated by emissions at this level. 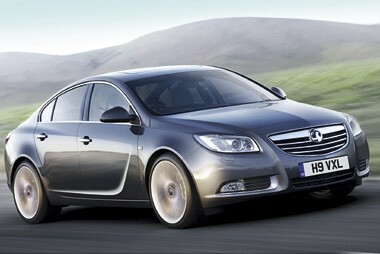 The Insignia proposition will feature heavily on the technology available to the car, much of it optional. The FlexRide system, offered on higher-end models, allows drivers to personalise the suspension set-up or leave it to automatically adapt to different driving styles and conditions, while the Front Camera System option reads speed warning and no-overtaking signs, warning the driver of their potential folly on the information panel. There’s also the latest-generation Adaptive Forward Lighting, which offers nine different spreads of light designed to suit the driving conditions, from long throws for motorways to peering at the roadside for pedestrians in town driving. Another attractive option for high-mileage company car drivers could be the Ergonomic Sport Seats, which Vauxhall claims have the car industry’s widest adjustment ranges, allowing drivers and passengers to find their ideal seating position. Prices start from £15,935 for the entry-level 1.6 Exclusive, while the equivalent 2.0 130 CDTi is £1,000 more. The likely biggest sellers are going to be the SRi models, with the diesels starting at £19,785. If that seems on the high side, EurotaxGlass’s are predicting residuals of around 37% after three years/60,000 miles and SRi models in all upper-medium Vauxhalls have always gone down a storm with buyers. The new model, having much more panache about it, should strengthen that situation. You really do have to keep reminding yourself that you are behind the wheel of a Vauxhall. The cabin is designed with a delicate elegance and style, while touches like the dials turning red when you press the sport button and the little red LED at the end of the needles illustrate a sense of humour and joy in developing the product. We tried the 2.0 turbo and 160bhp diesel. The petrol is a very good engine, extremely quiet and refined, and with an impressive stab of power when you need it, though the sensitive throttle required some love and attention. The diesel, a development from the old 1.9 engine rather than an entirely new unit, didn’t have such a good start. When cold, it is disconcertingly noisy with quite a lot of vibration. Warmed up, things improve noticeably, but it isn’t an engine that likes to be revved, as it starts to sound harsh higher up the range. In everyday driving, between 1,500 and 3,000rpm is fine. Both have excellent, precise gearchanges and the seating position is good. I really like the way the cabin feels wrapped around you, unlike the vast plastic savannahs of the Mondeo’s interior. Vauxhall opted for buttons rather than spangly touch screens and ‘human machine interfaces’, because it claims it is easier to use and requires you to spend less time peering into the dash and more time looking at the road. Call me old fashioned, but I prefer it. As for handling, the entirely new suspension is an improvement over the Vectra, as you would expect. It has lots of composure through bends but has been set up primarily as a comfortable motorway machine, with some play in the steering part of that set-up. 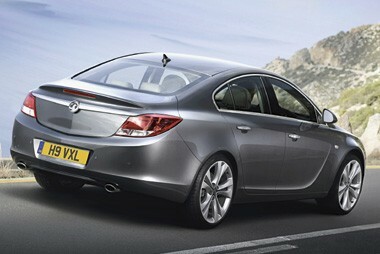 The Insignia is a major step forward for Vauxhall. It is easily the classiest vehicle in the Vauxhall range and drivers should find it a much easier car to love than the Vectra. The all-important diesel engines are just about OK, but the real strengths are its slinky looks and quality cabin.